Metabolism refers to the collective chemical processes that convert food into energy. Similar to gas for your car, food is your body's fuel. If you have a fast metabolism, your body lacks fuel efficiency. Compared with someone with a normal or slow metabolism, your body is not as efficient at converting food into usable metabolic energy. Genetic factors, hormones and certain medical conditions affect your metabolic rate. Basal metabolic rate is the amount of energy your body requires to sustain basic life functions. Around-the-clock operations of your internal organs, including your heart, brain, liver, lungs, kidneys and intestines, consume most of the energy used during periods of rest. Your muscles also consume a moderate amount of energy at rest. Your fat stores, or adipose tissue, consume a low level of energy. Thyroid hormones directly affect your basal metabolic rate. Abnormal elevation of your thyroid hormone levels and the associated increase in metabolic rate typically cause unintentional weight loss and increased appetite. When you eat, your stomach, intestines, pancreas, liver and gallbladder go to work, digesting the food and making it available to the rest of your body. The energy consumed by your digestive system during these processes is called the thermic effect of food. Nutritionists Sari Edelstein, Ph.D., R.D., and Judith Sharlin, Ph.D., R.D., report in their book "Life Cycle Nutrition: An Evidence-Based Approach" that the thermic effect of food accounts for approximately 10 percent of your body's total energy expenditure. With a fast metabolism, the thermic effect of food is greater than among people with an average metabolic rate. Conversely, overweight and obesity may be associated with a lower than usual thermal effect of food. Your metabolic rate typically increases with acute illness or injury, such as a serious infection, accident, surgery or burns. Health care professionals refer to this increased demand for energy as metabolic stress. Your body must work overtime to heal during periods of metabolic stress, which means you require significantly more calories than usual. Acute metabolic stress may cause substantial weight loss if you fail to boost your caloric intake to meet your body's increased metabolic demands. Chronic diseases that cause one or more of your body systems to work harder than usual can increase your metabolic rate. Emphysema and chronic bronchitis, for example, increase the work of breathing and augment your caloric needs. Chronic inflammatory conditions, such as system lupus erythematosus, are characterized by an overactive immune system and increased caloric need. Weight loss caused by a fast metabolic rate is commonly a symptom of cancer. 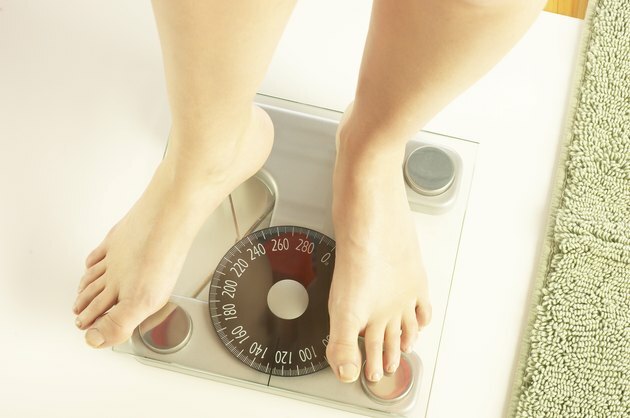 If you experience unintentional weight loss, see your doctor to determine the underlying cause. Human Physiology: From Cells to Systems; Lauralee Sherwood, Ph.D.
Life Cycle Nutrition: An Evidence-Based Approach; Sari Edelstein, Ph.D., R.D., Judith Sharlin, Ph.D., R.D. Pediatric Endocrinology: Mechanisms, Manifestations, and Management; Ora Hirsch Pescovitz, M.D., Erica A. Eugster, M.D. Nutrition and Diet Therapy: Principles and Practice; Linda K. DeBruyne, M.S., R.D., et al. Advanced Nutrition and Human Metabolism; Sareen S. Gropper, Ph.D., R.D., et al.